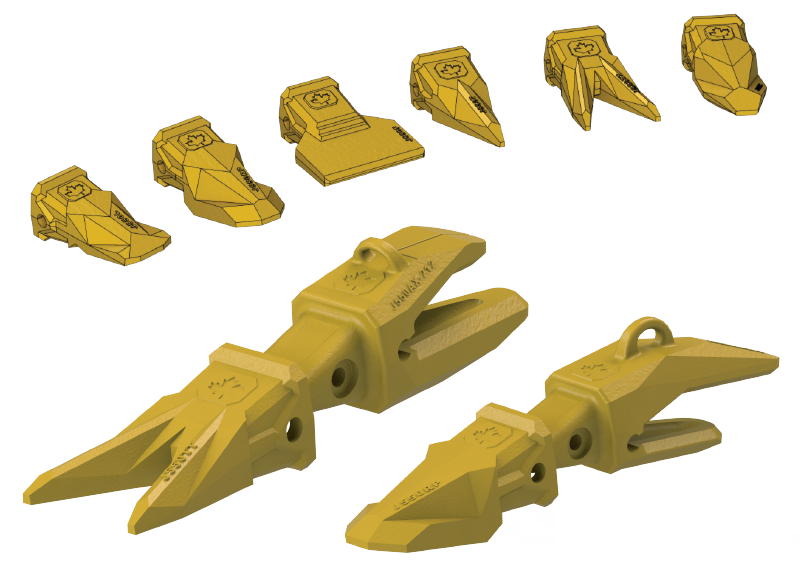 VBL™ self-sharpening side pin teeth are a great choice for any bucket requiring high-performance wear parts. Using computer models and wear simulations VBL™ side pin teeth have been engineered with high performance, self-sharpening features on all shapes and sizes. (L) Long — Good combination of wear life and penetration. Basic choice for loaders or excavators. (RP) Rock Penetrator — A penetration shape plus an engineered wear pad on the bottom make an excellent design for front-end loaders. (F) Flare — Wide, flat profile leaves a flat floor as well as extends bucket capacity. Great choice for excavators in loose material. (T) Tiger — Sharpest tooth available for high penetration in hard-packed materials. (TT) Twin Tiger — Double version of tiger primarily used on the ends of the bucket to cut clearance. (RC) Rock Chisel — Best choice for heavy impact in rock, will penetrate well and pry rocks loose.